Figure displaying geographically variable response of Dendrontonus ponderosae to winter warming in the western US. Published in Landscape Ecology 2015. 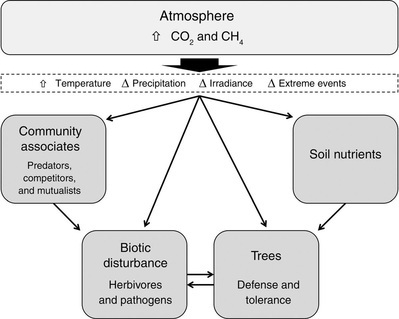 General pathways by which atmospheric changes associated with increasing greenhouse gases can influence forest disturbance from insects and diseases. Published in Ecological Monographs 2013. 25. Miller, K.M., McGill, B.J., Mitchell, B.R., Comiskey, J., Dieffenbach, F.W., Matthews, E.R., Perles, S.J., Schmit, J.P. and Weed, A.S. 2018. Eastern national parks protect greater tree species diversity than unprotected matrix forests. Forest Ecology and Management 414 (2018): 74-84. 24. Lombardo, J. A., Weed, A. S., Aoki, C. F., Sullivan, B. T., & Ayres, M. P. (2018). Temperature affects phenological synchrony in a tree-killing bark beetle. Oecologia, 10.1007/s00442-018-4164-9. 23. Weed, A.S., Milan, J. Schwarzlaender, M. 2017. 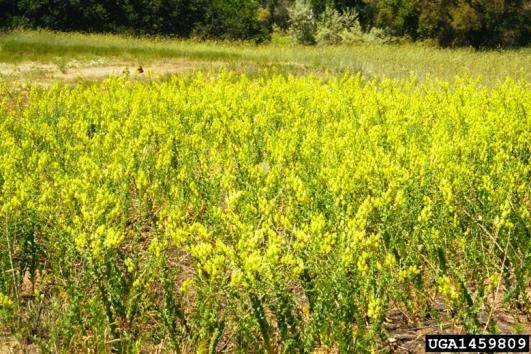 Analyses of nine years of citizen-based biological control monitoring of Dalmatian toadflax, Linaria dalmatica (Plantaginaceae) in Idaho, USA. 63(3) : 449-460. 20. Weed, A.S., Elkinton, J., and Lany, N.K. 2016. Density-dependent recruitment and diapause in the spring-feeding generation of hemlock woolly adelgid (Hemiptera: Adelgidae) in western North America. Environmental Entomology. DOI: 10.1093/ee/nvw107. 19. Miller, K. M., F. W. Dieffenbach, J. P. Campbell, W. B. Cass, J. A. Comiskey, E. R. Matthews, B. J. McGill, B. R. Mitchell, S. J. Perles, S. Sanders, J. P. Schmit, S. Smith, and A. S. Weed. 2016. National Parks in the eastern United States harbor important older forest structure compared with matrix forests. Ecosphere. doi: 10.1002/ecs2.1404. 18. Ladin, Z. S., C. D. Higgins, J. P. Schmit, G. Sanders, M. J. Johnson, A. S. Weed, M. R. Marshall, J. P. Campbell, J. A. Comiskey, and W. G. Shriver. 2016. Conserving avian biodiversity and ecological integrity for current and future generations through long-term monitoring and integrated citizen science. Ecosphere. doi: 10.1002/ecs2.1464. 17. Kolb, T.E., Fettig, C. J., Bentz, B.J., Stewart, J. E., Weed, A.S., Hicke, J.A., Ayres, M.P. 2016. Observed and anticipated impacts of drought on forests insects and diseases in the United States. Forest Ecology and Management. 380: 321-324. 15. Kolb, T.E., Fetting, C.J., Bentz, B.J., Stewart, J.E., Weed, A.S., Hicke, J.A., Ayres, M.P. 2015. Chapter 6. Insects and Pathogens. National Drought Synthesis: a comprehensive science synthesis for the U.S. forest sector. USFS Gen. Tech. Report. 14. Weed, A.S, Ayres, M.P, and Bentz, B.J. 2015. Population dynamics of bark beetles. pp. 157-176, In Bark Beetles: Biology and Ecology of Native and Invasive species, F.E. Vega and R.W. Hofstetter (eds.). Elsevier. 10. Bourchier, R.S., Weed, A.S., R. Casagrande, A. Gassmann, S. Smith, and N. Cappuccino. 2013. Vincetoxicum nigrum (L.) Moench, V. rossicum (Kleopow) Barbar., dog strangling vine (Asclepiadaceae). pp. 402-407, In Biological Control Programmes in Canada 2001-2012, P. Mason and D. Gillespie (eds.). CABI Publishing, UK. ​9. Ayres, M.P., Hicke, J. A. and A.S. Weed. 2012. Section 3.3.3. Insect and Diseases. In Section 2. Effects of variability and change on forest ecosystems: a comprehensive science synthesis for the U.S. forest sector. Vose, James M.; Peterson, David L.; Patel-Weynand, Toral (eds.) Gen. Tech. Rep. PNW-GTR-870. Portland, OR: U.S. Department of Agriculture, Forest Service, Pacific Northwest Research Station. 265 p.
8. Ayres, M.P., Hicke, J.A., Kerns, B.K., McKenzie, D., Littell, J.S., Band, L.E., Luce, C.H., Weed, A.S., and Raymond, C.L. 2014. Chapter 4: Disturbance Regimes and Stressors, In Climate Change and United States Forests, Advances in Global Change Research, D.L. Peterson et al. (eds.) , pp. 55-92 Springer.